The Federal Reserve's leadership may have changed, but the message remains the same. The Fed will continue reducing its stimulus as the economy gradually improves, Janet Yellen told the House Financial Services Committee on Tuesday. Yellen, who was sworn in as Federal Reserve chair last week, stressed that she expects "a great deal of continuity" in Fed policy, following in the footsteps of previous Chairman Ben Bernanke. Since January, however, the Fed has gradually been reducing the pace of that stimulus. After buying $85 billion in bonds per month since September 2012, the Fed cut its purchases to $75 billion in January, and then to $65 billion in February. In her testimony, Yellen said the Fed plans to continue winding down the stimulus program "in further measured steps at future meetings." She also reiterated that the Fed intends to keep its key interest rate near zero "well past the time" the unemployment rate falls to 6.5%. Focus on the job market: In January, unemployment neared that level, falling to 6.6%. But the Fed isn't likely to consider that a success. Much of the decline in the unemployment rate over the last three years has come from Americans dropping out of the labor force. "We shouldn't focus only on the unemployment rate," Yellen said. Meanwhile, inflation remains well below the Fed's goal of 2% per year. "Too many Americans remain unemployed, inflation remains below our longer-run objective, and the work of making the financial system more robust has not yet been completed," Yellen said. 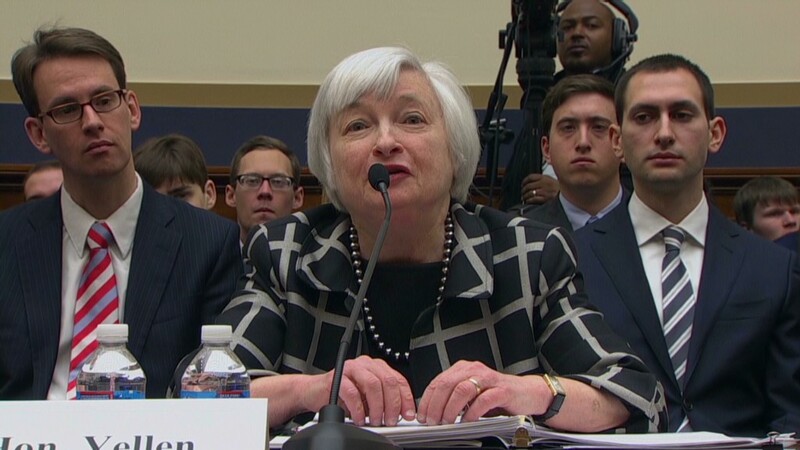 Like Bernanke, she pointed to ongoing concerns about the long-term unemployed. As of January, about 3.6 million Americans were unemployed for more than 6 months. They make up 36% of the unemployed. Another 7 million Americans were classified as "part-time for economic reasons," meaning they worked fewer than 35 hours a week due to slack work, unfavorable business conditions or inability to find a full-time job. Volatility in global markets is not a 'substantial risk': Asked about recent turmoil in emerging markets, Yellen defended the Fed as merely doing its job as laid out by Congress. By law, the Fed is tasked with two goals: maximize U.S. employment and keep U.S. prices stable. The law says nothing about how the central bank's policies reverberate throughout the rest of the world. Foreign currencies in countries like Brazil, India, Indonesia, Turkey and South Africa -- dubbed the "Fragile Five" -- have plummeted over the last year, as the Fed signaled it was prepared to start winding down its stimulus. For a few years, low interest rates in the U.S. had been enticing investors to seek higher yields in emerging economies. Now that Fed tapering is underway, some have been pulling money out of those countries. Yellen said the Fed has "been watching closely the recent volatility in global financial markets" but so far, it seems "these developments do not pose a substantial risk to the U.S. economic outlook." Get ready for a repeat on Thursday: In her new role, Yellen is required to report to Congress twice a year -- a procedure that is required by the Humphrey Hawkins Act. In addition to her testimony before House lawmakers on Tuesday, she is also scheduled to deliver identical prepared remarks before the Senate Banking, Housing, and Urban Affairs Committee on Thursday.